This chapter lays out the scope of the book by discussing connections between political unrest in the 1960s and 2019. It lays out a postsecular perspective and argues for an aesthetic approach to the material, connecting philosophical discourse between Europe and the United States and defines liberalism. Building a poetic and metonymic description of psychedelic aesthetics, it particularly addresses affective waves and notions of insurrection as espoused by groups such as The Invisible Committee in France. 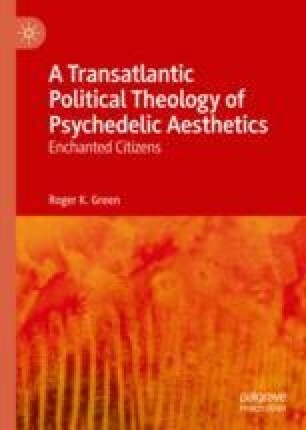 It argues for a broader framing of psychedelic aesthetics by discussing shifts in twentieth-century European thought regarding aesthetics and briefly contextualizes the domestication of rhetoric around psychedelics in recent years.